My pilgrimage has begun well. There's too much to tell, even three days' worth. 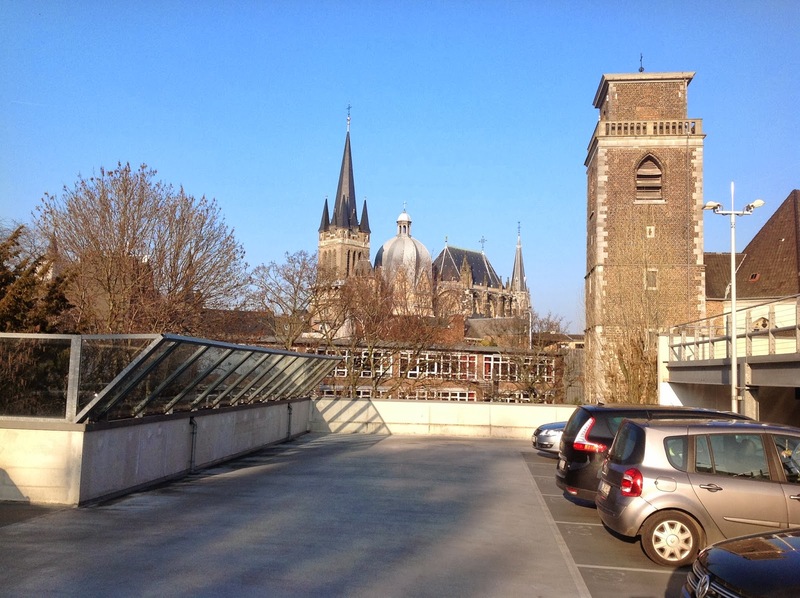 When I arrived at my hotel in Aachen, I was too tired to post anything. Last night was a comedy of errors as far as the Internet goes. Today brought many more...adventures, but none really (well, one) involving the Internet. Ready? Let's go. First let me explain what this trip means to me. This is the land where so many of my ancestors came from. The Foxes seem to have come from the upper Rhine, although another location in Germany is attested. My grandmother, Mayme Henschemeyer, and her parents also came from Germany, but I'm not sure just where. More than that, so many of Cincinnati's people, their culture and history, is German -- so that adds another layer. All of us in Cincinnati know about how the Germans who first came, and saw the Ohio, and the hills on either side, said it reminded them of the Rhine. Driving around Germany the past three days, I can see it; the rolling hills and farmland and meadows could be the hills of Ohio or Kentucky. When I see the people of Germany, I can tell: lots and lots of Americans came from here. (Even at the time of our revolution, there was a sizeable German population in the colonies -- including my ancestors.) When I sat down tonight in Bamberg (where I'm staying) for a very well deserved dinner, I asked the waitress for a "sehr Bambergische bier"* and meal. She said OK and brought me Schlenkerla Rauschbier and grilled pork shoulder with cabbage and a potato dumpling. Now, I'd never seen a potato dumpling before, and this looked like a matzo ball that never found it's way into the soup; and the cabbage was pureed -- a surprise! Still, when I tasted the pork with the gravy, I told the couple sharing the large table with me, "it tastes like home!" In many ways, this feels like home. There's a second reason I wanted to come here. The times in which we live and the long shadows of history that still touch us, are all bound up with so much that happened here. I don't just mean the events of the 20th century, although those would be enough: three world wars (one cold), with each war's horrors being so much a product of the resolution of the war before. But to that I could add, from the 19th century, national consciousness and Marxism; before that, the glittering age of Baroque art and music; and before that, the Protestant Reformation and all the historic-making ripples that sent round the world to this day. 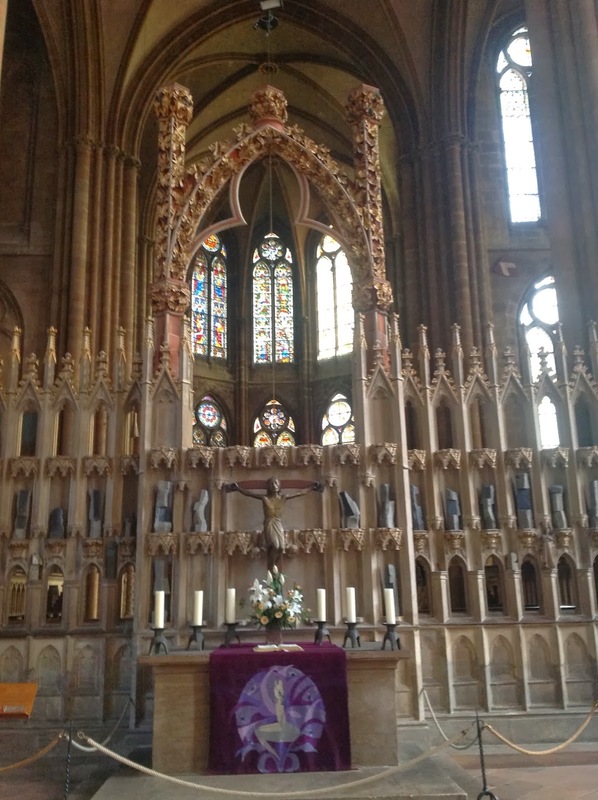 And before that, the glories of Christendom, the soaring ambitions realized in faith, scholarship and architecture. Of course, all this -- good and bad -- is not solely German; but Germany has been at the center of it. By the way, I had no trouble finding it. Even miles away, I could see the spires of the great cathedral, towering over the city. As I drove into the city, all I had to do was to drive toward those coal-black peaks. But I was about to say. As I found my way to the cathedral; I parked, and walked up into the city, around some modern buildings -- and there it was! I hurried, although I didn't have to. I scrambled up the stairs, and rushed to the doors. The lady who was giving out Rosaries? That's her on the right. A woman passing out literature detained me; I was polite; she was asking me if I knew Jesus, and I said yes. I gave her a few coins for Rosary materials, and then, I nodded toward it -- this wonder before us both, as if to say, how can you stop me? I have to go! 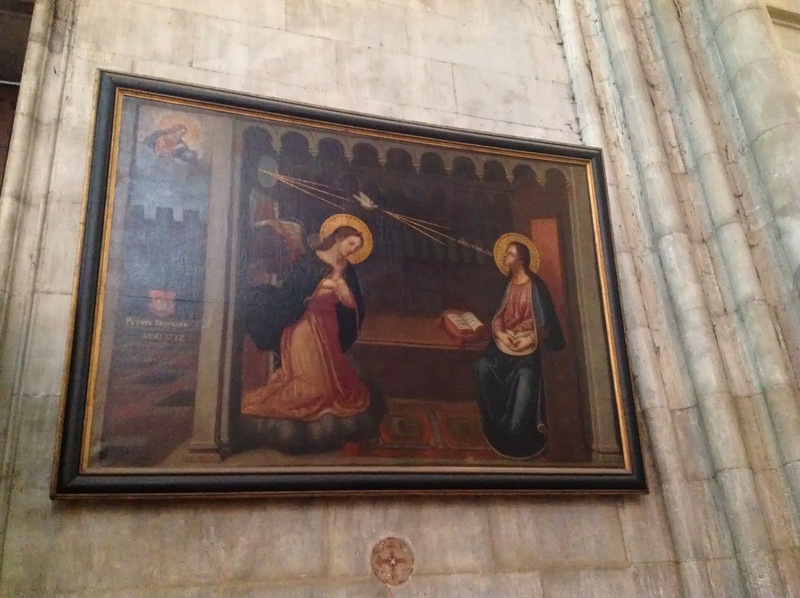 A close-up of the image of Mary with our Lord at the front of the cathedral. And then I stepped inside. And I looked up. And I almost cried. Yes, because it's beautiful -- "beautiful" -- what a poor word! All words are shamefaced before such wonders. Some are natural marvels, crafted by the hand of God himself. But others are crafted by the hand of man, summoning up all that is in him to give expression to the glory that God has revealed to man. That is what this cathedral is: a wonder built by men who saw a vision of God, and tried desperately to give expression to that vision, somehow. And so what moved me also was to behold this beauty, this accomplishment, this composition, this "word" -- it was spoken; this symphony exists, and it is still playing. And because it is the work of Christendom, it's not just "theirs," it's ours. And in that moment, it was mine. 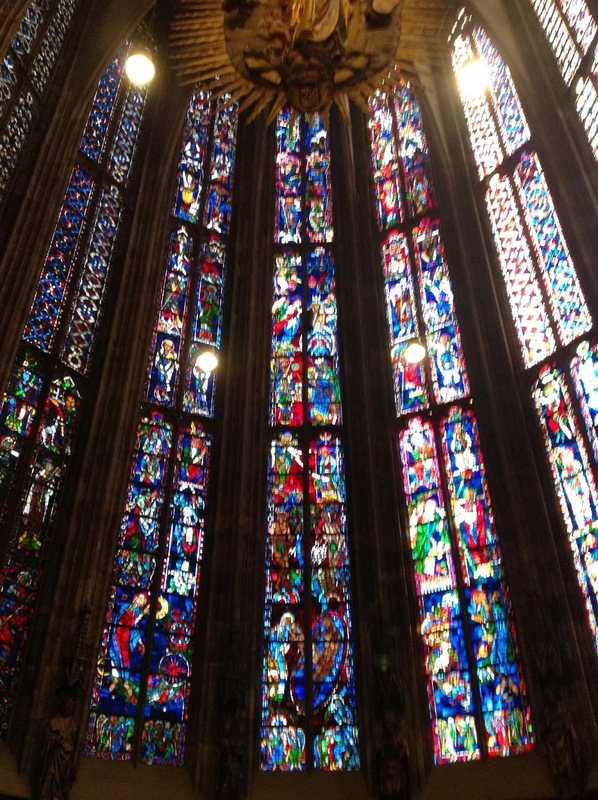 I'm not sure if you can see it in this picture -- that's Saint Christopher in the foreground -- but high up, you might be able to see a line in the windows: below are images, above are windows with only geometric patterns. While I don't know which, many of the windows were destroyed in the war, and their replacements are not their equal. 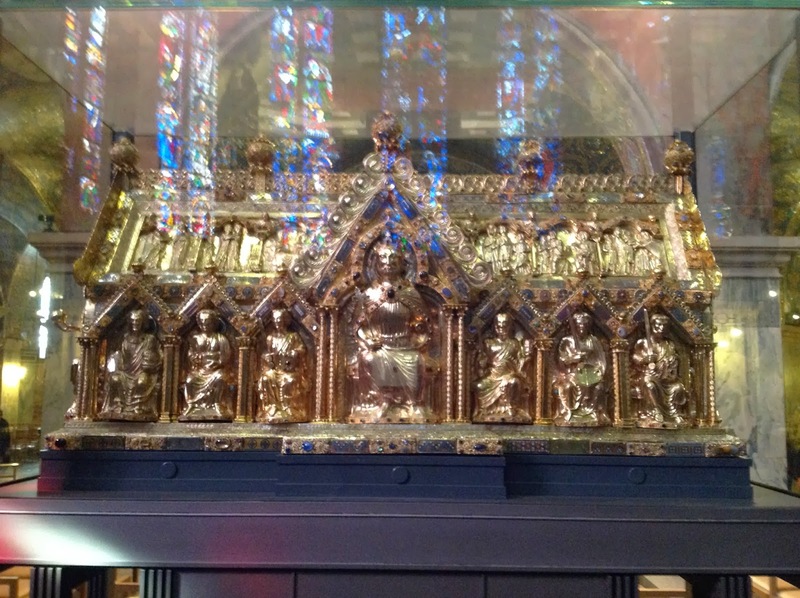 No, dear reader, I didn't forget about the famous relics that are housed here -- the bones of the Magi. 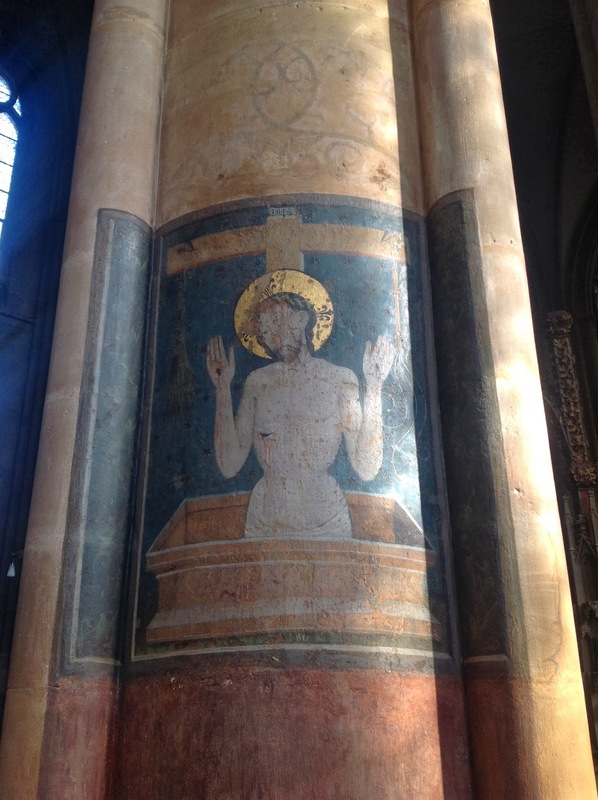 Alas, I have no good photograph of that, as they are kept in the apse of the church, and this was off limits -- even to me! 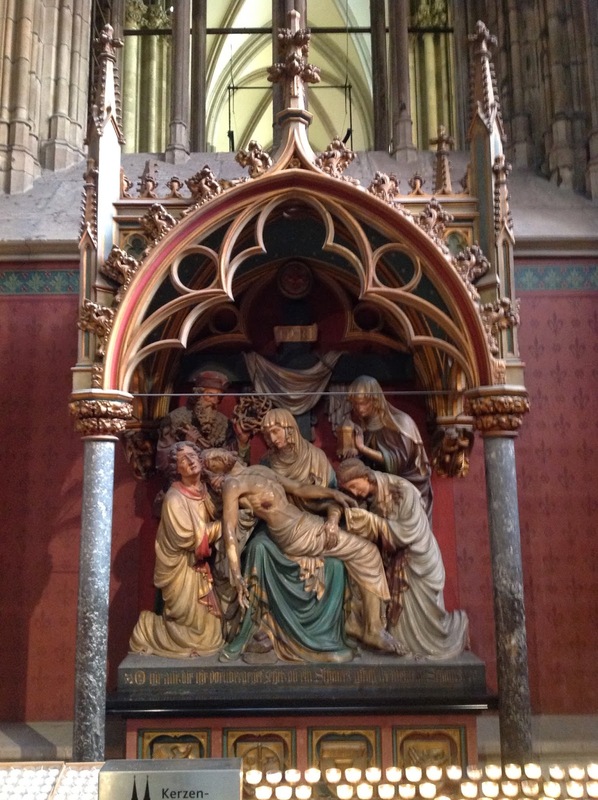 But here are some lovely images from the cathedral. This picture is amazing -- I've never seen anything like it. You'll have to blow this up to see what I'm going to describe. Do you see the rays coming in the window, over the shoulder of the Archangel Gabriel, kneeling before our Lady? In the center of the rays, can you see the dove, and more rays from the dove? When I saw this, I saw what you see now: something odd there, right in front of Mary's face. But looking closer, they are words. And they are written backward -- i.e., they begin from Mary, and go away from her, indicating they are her words: "Ecce ancillae Domini" -- "behold, the handmaid of the Lord. That's when I saw the image of the Father, outside the window. Then I noticed the words on the book, open beside our Lady: from Isaiah 7:14: Behold, a virgin shall conceive and bear a child. It all clicked. Do you see what the artist is showing us? Gabriel interrupted Mary in prayer and contemplation; he speaks God's message; Mary gives her fiat -- and her very words convey, if you will, the indwelling of the Holy Spirit that effects the Incarnation. Beautiful! Well, I would love to tarry at Cologne, but I must travel backwards in time to my first day, and then I'll describe today's adventures. From Frankfurt Airport, I made my way first to Koblenz. Why here? 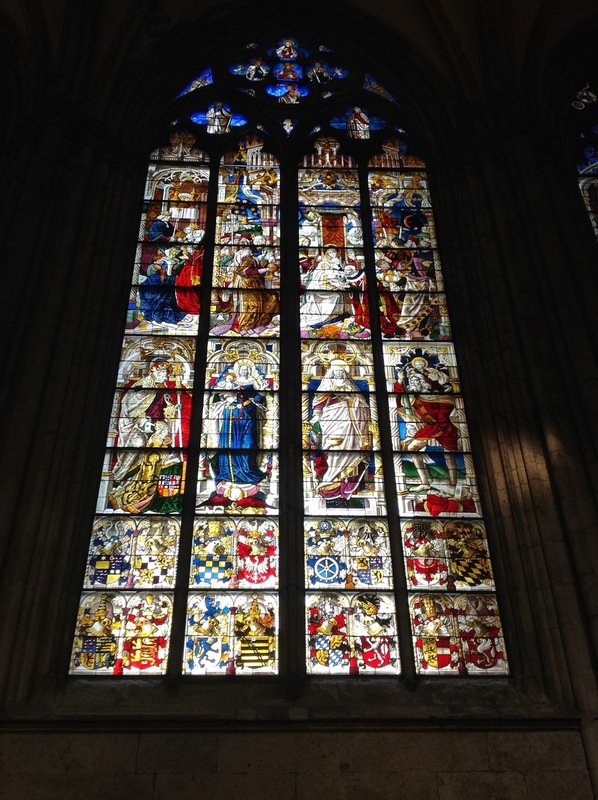 My original plan was to make my first stop Aachen -- the place where Charlemagne was crowned, and where his bones remain to this day. 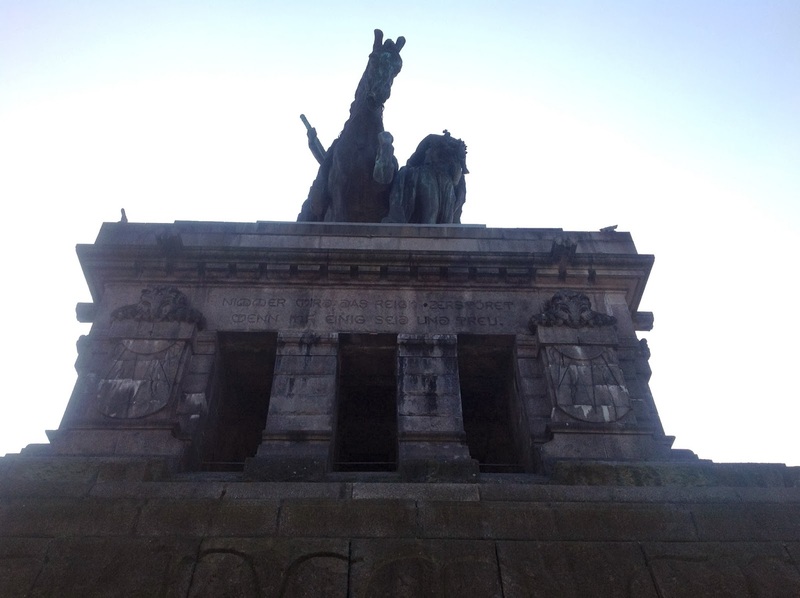 But I discovered Koblenz had a cool monument which I decided to go see: the Deutsches Eck. 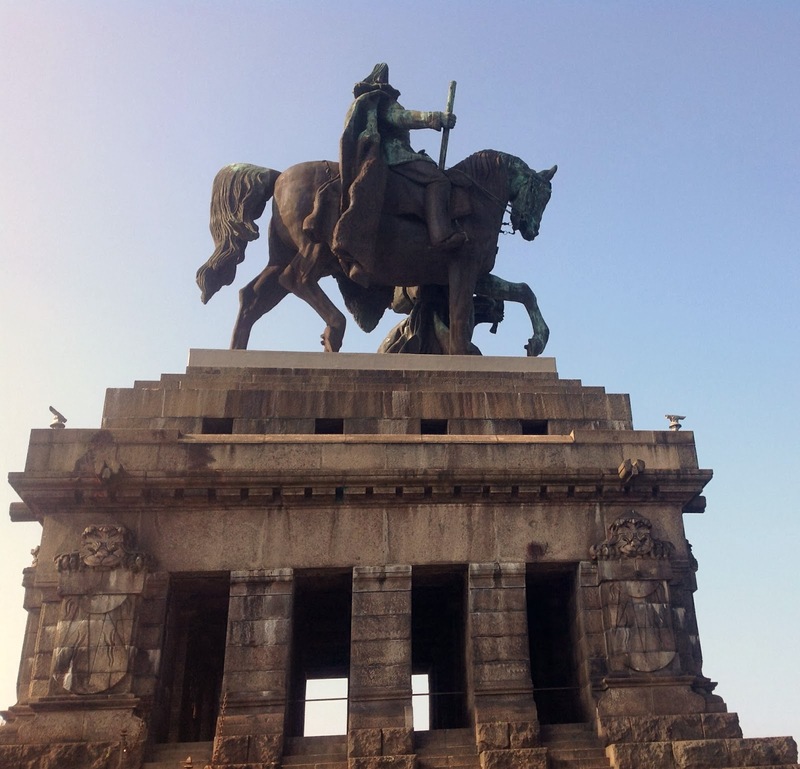 This is the site of a famous monument to German unification, first erected in 1897 to honor Kaiser Wilhelm I (not the execrable Wilhelm number 2), who became the first emperor of a united Germany. 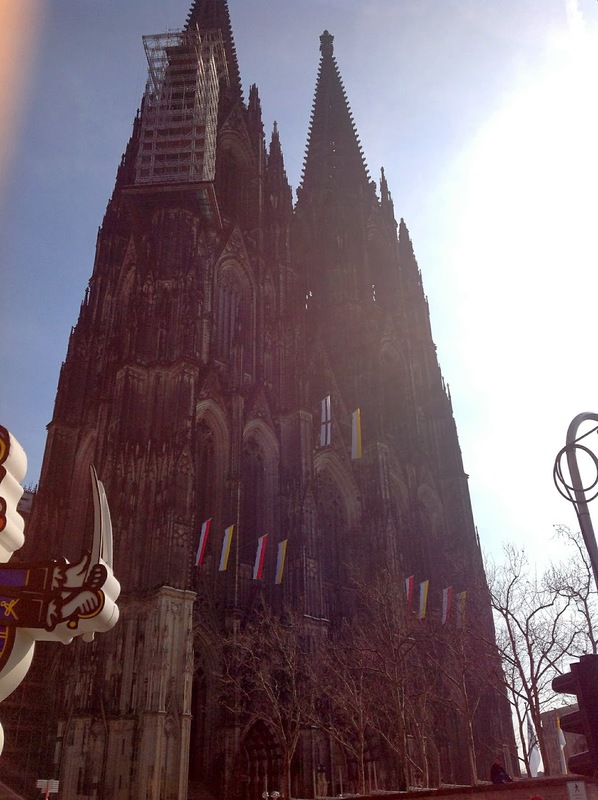 It was wrecked during World War II, but when Germany was divided by the Cold War, the monument was restored. Now, this is as good a moment to explain that I'm now driving in Europe. I don't do this often; and I've never driven, of course, in Germany. May I remind you, dear reader, that in addition to having "two way" streets that are narrower than our one-way streets in the United States, virtually nothing on the signs makes any sense to me (more on that later)? And, because car rentals are terribly expensive here, I'm driving an econobox and I fit into it...badly (although I figured out how to adjust seat -- but not until much later). And, all but the high-end rentals were standard-shift transmission. Now, I know how to drive a stick, but it's been (*cough! *-eleven-*cough*) years since I drove one. Starting out, I was a bit...rusty. Oh, and I did I mention that everything isn't in the same spot on a German Opel as it is on cars I'm familiar with? Oh, and did I mention I was driving on the autobahn? Where they don't have a "fast lane," they have a freaking really fast lane? And did I mention that I had no directions? 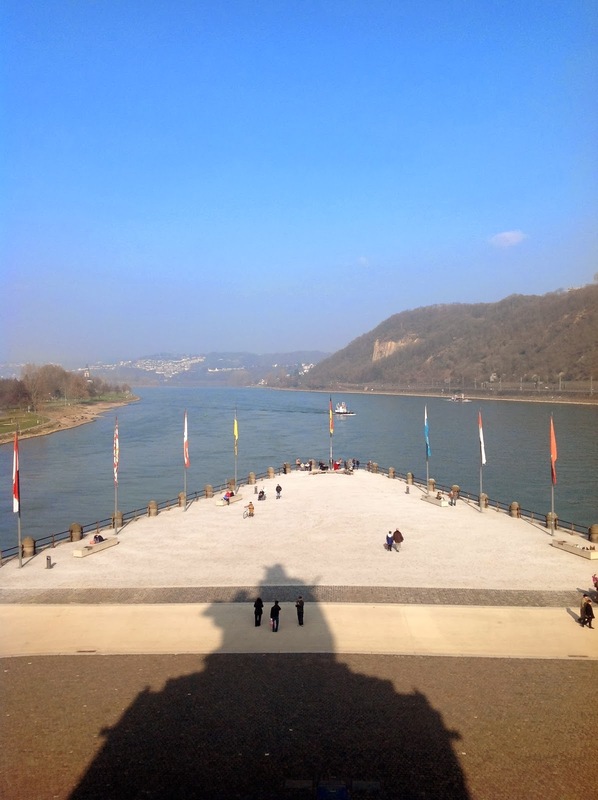 That's the Rhine as it flows northward to the sea. Get a load of that shadow, however! 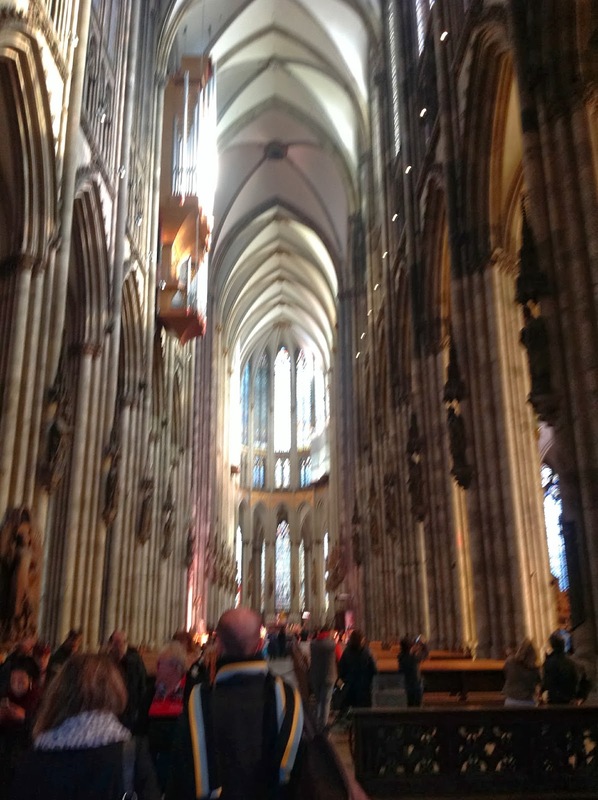 Well, that was a lovely visit, but it was about 3, and I wanted to get to the cathedral in Aachen before it closed, if possible, so I could inquire about offering Holy Mass there the next day. Thankfully, Aachen wasn't terribly far. Now, I imagine some of my readers have driven in the ancient cities of Europe, so you can laugh at this next part. But for those of you who, like me, haven't done this...well, I have some middling idea of what "rats in a maze" psychology might be like. Round and round the streets go, not in grid patterns. And they were plenty wide for people, and probably horses, but cars? Going both ways? 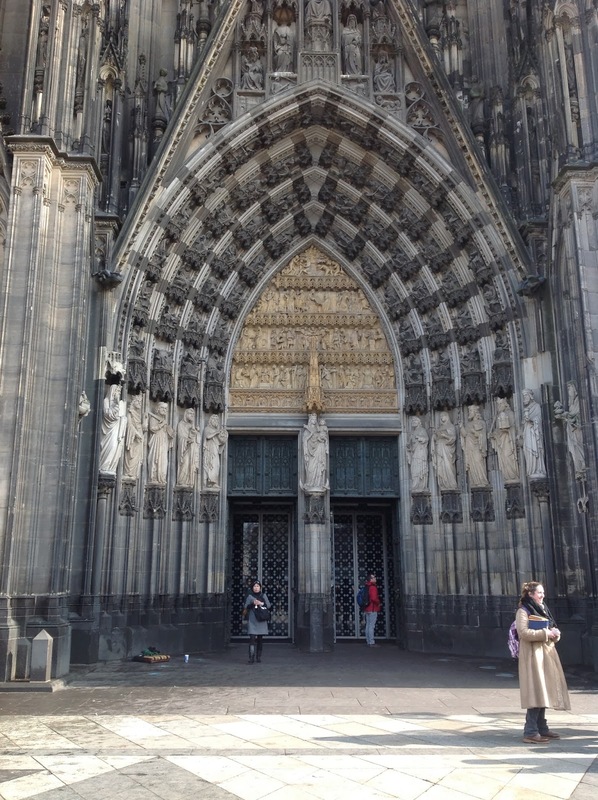 Well, somehow I found my way to the center of the city; and, thankfully, they're really proud of their cathedrals, so the word "Dom" shows up on signs, which I figured out in Cologne. But there's no such thing as free parking at these "downtown churches"! If it looks like a crazy-quilt, you're right. 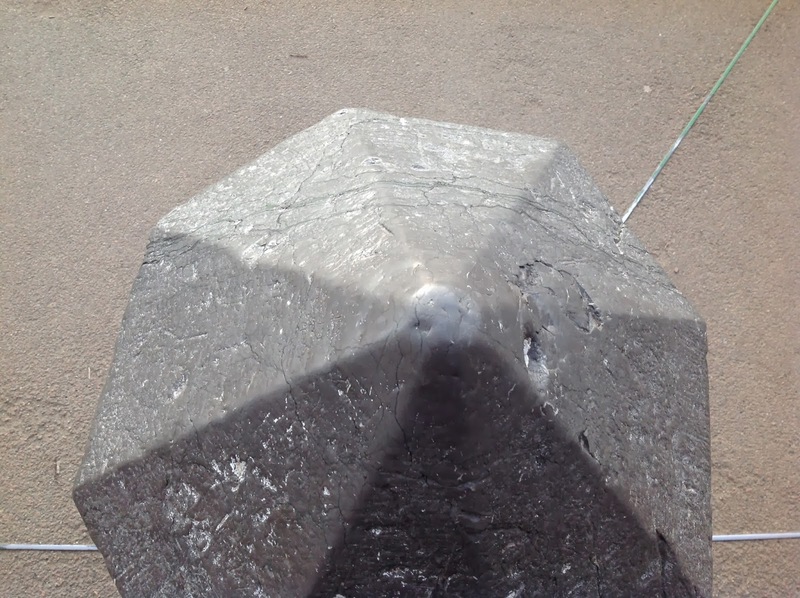 You can read about it here (and find better pictures). Well, thanks to the help of my guardian angels (they are exhausted, by the way -- at least, they should be), I found someone who found someone who found the sacristan, and he said I could offer Mass at 8:30 the next morning. I didn't tarry to visit the cathedral then, because I figured I'd have time to do that the next day. 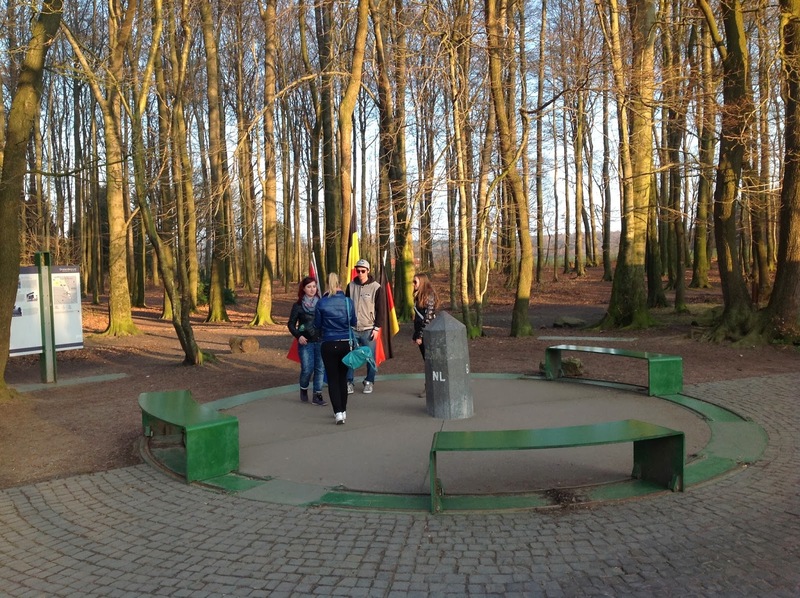 It was a bit of a trick getting out of town -- round and round -- but at one point, I saw a sign for "Vaals." And then I remembered what I'd read about that town: it's right near the border with the Netherlands and Belgium, and there's a spot where all three countries meet. It was about 5 pm, and it was only a few miles away, so why not? So -- no map, no German, certainly no Dutch or Flemish -- off I go! A little after this, I chatted with a couple from the Netherlands, and he claimed someone figured out the marker was in the wrong spot by about 60 meters, but no one could be bothered to put it right. Well, heck! I wasn't going to go home and have to admit I missed Belgium by a few yards, so I hiked over in the general direction...and sure enough: where the signs were in Dutch at the mini-amusement park I'd come through to the spot, on the other side were signs in French, which is what they speak in this part of Belgium. At this point, the shadows were lengthening (not as long as this post will be -- hoo boy! ), so I thought I'd better get back. Did I mention I had no directions to my hotel, just the name, and the address? And a street "grid" only the Riddler could love? And, now, I'm in a whole different country -- and I'm not sure which one? Or how to get back? Well, round and round I went, through Belgium, then the Netherlands, then Belgium again, before I found the road I'd taken from Germany. Then I found my way to the south -- was it south? -- side of Aachen. More rabbit-warrens pretending to be city streets. How I did it I have no idea (yes I do: I prayed to Saint Anthony), but I found my way to "Adenauer Allee" (that's Konrad Adenauer, a great man), and there's my hotel at the intersection of -- get this! -- "Karl Marx Allee"! 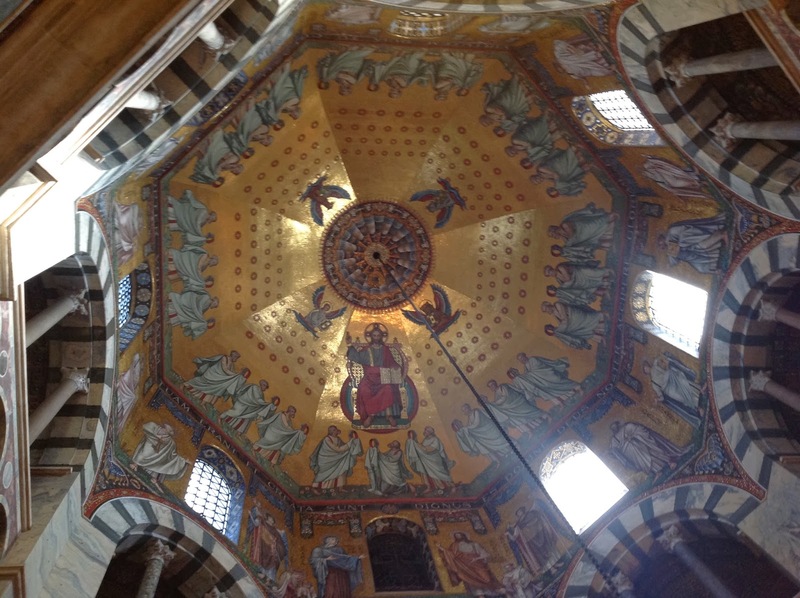 So next day, I am back at Aachen Cathedral. The sacristan -- Norbert -- is waiting, and shows me to a small chapel, hidden away. He provided me a Latin missal, and I was set. After Mass, my plan was to get some breakfast, and then come back to visit the cathedral. If it seems very Byzantine in style, you're correct. Remember, this long predates the Gothic period; this was built for the new Roman Emperor, as Charlemagne styled himself. When he crowned himself, in this city, in AD 800, Irene reigned as Empress in Constantinople. 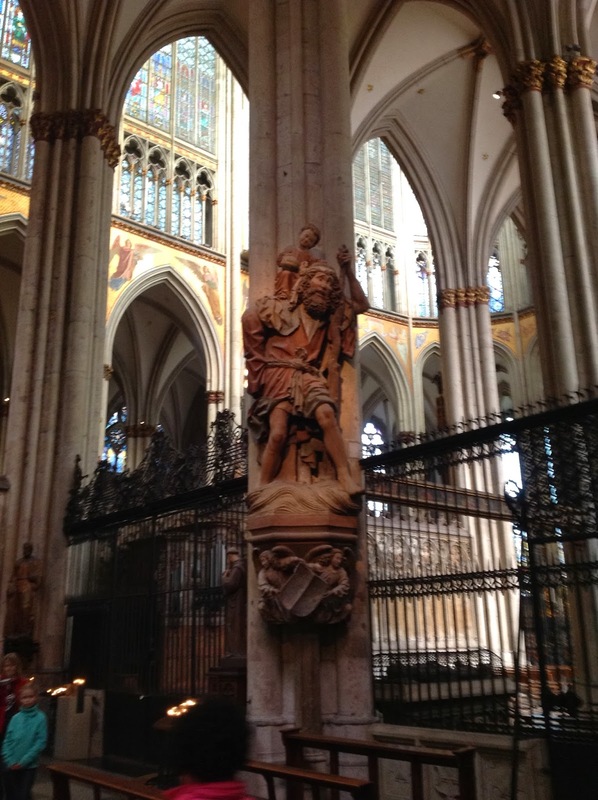 About this time, Norbert sees me -- he's behind the altar, getting things together after Mass, and he signals me. When I walk over, he says a few words to another fellow, who opens the gate that leads to the "choir" area behind the altar, which otherwise was off limits. Some other visitors see this; but my new friend shakes his head -- just me. This contains four precious relics: swaddling clothes used by the Blessed Mother, as well as her mantle; the Lord's loincloth, and the cloth that held the head of John the Baptist. 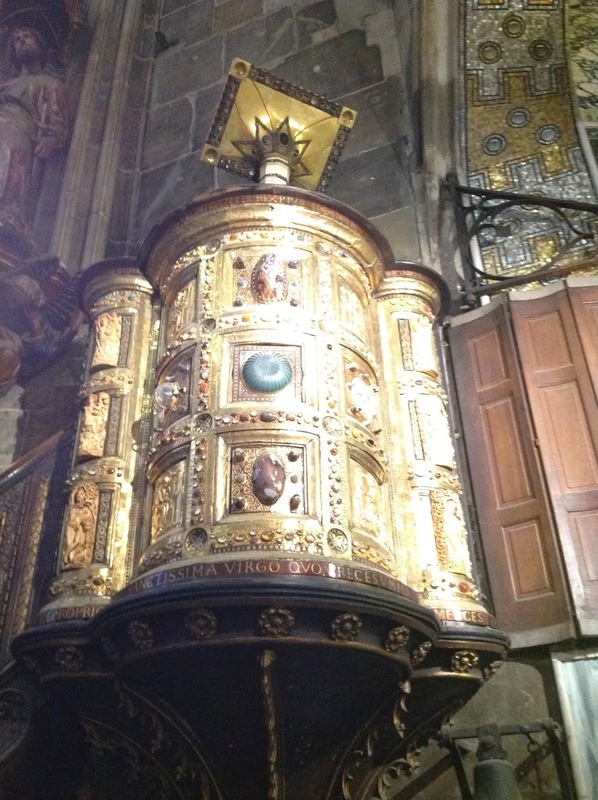 The relics are displayed every few years, last in 2007. This cathedral served as the imperial cathedral for centuries, witnessing the crowning of many kings and emperors. Emperor Otto I is buried here, for example. 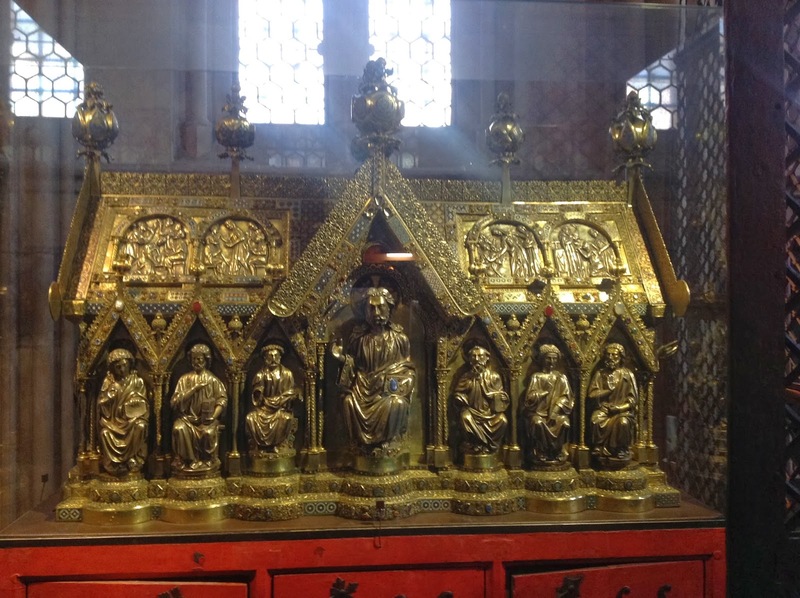 This ambo was a gift of Emperor Saint Henry II, about whom I hope to say more in my next post. 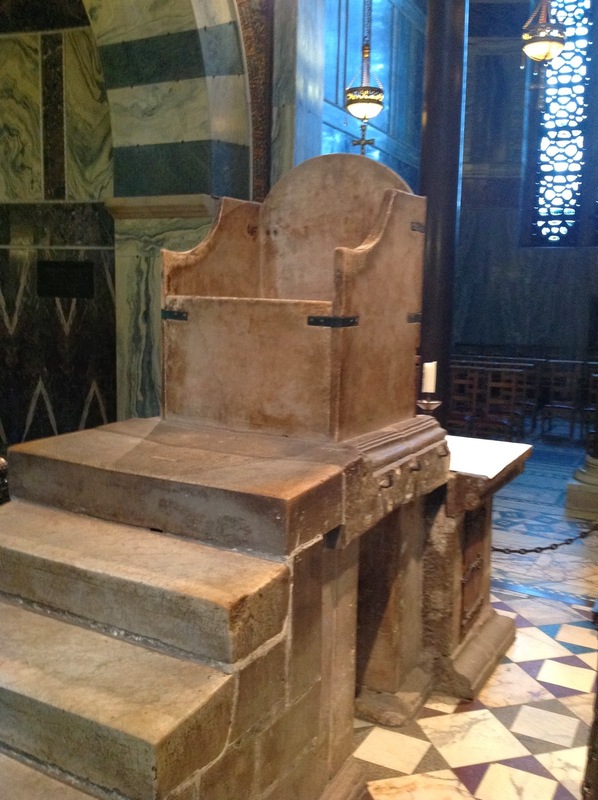 That is the Throne of Charlemagne, commissioned by the emperor himself. It was used for coronations until the 16th century. Johann pointed out to me some graffiti scratched into one side; but he spoke almost no English, so I didn't know what he was telling me. I'm guessing he was telling me what you can read at the link I gave you: that the marble used for this throne was used before. One theory is that the stone was taken from the Church of the Holy Sepulcher in Jerusalem -- i.e., the site of our Lord's crucifixion. Or, they may have been the steps of Pilate's palace. Scratched into the side are lines that form a board for an ancient game that Roman soldiers would have known, but was played for many centuries after as well. Sorry, I'm telling this story like a Quentin Tarantino movie; but to clarify, after having Mass in Aachen on Friday, I visited Cologne Cathedral, and then drove to Marburg -- where I had my no-Internet follies (the two women at the desk somehow got the notion that the problem must be my computer, or the password -- even though I never used the password, as I never got that far). That brings me to this morning. 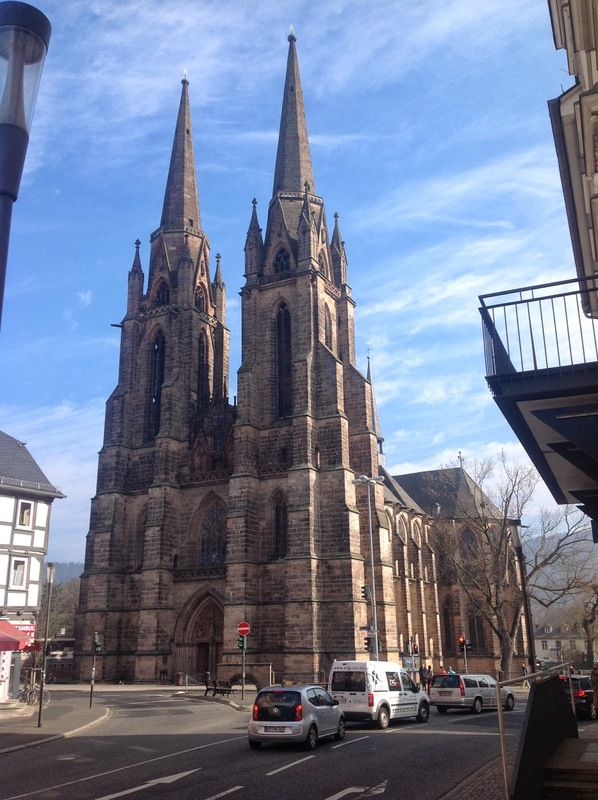 After breakfast at the hotel near Marburg (at which the Internet finally made an appearance, enabling me to upload, from my iPad, all the pictures I've shown you so far), I drove into the city of Marburg. What will we find there? 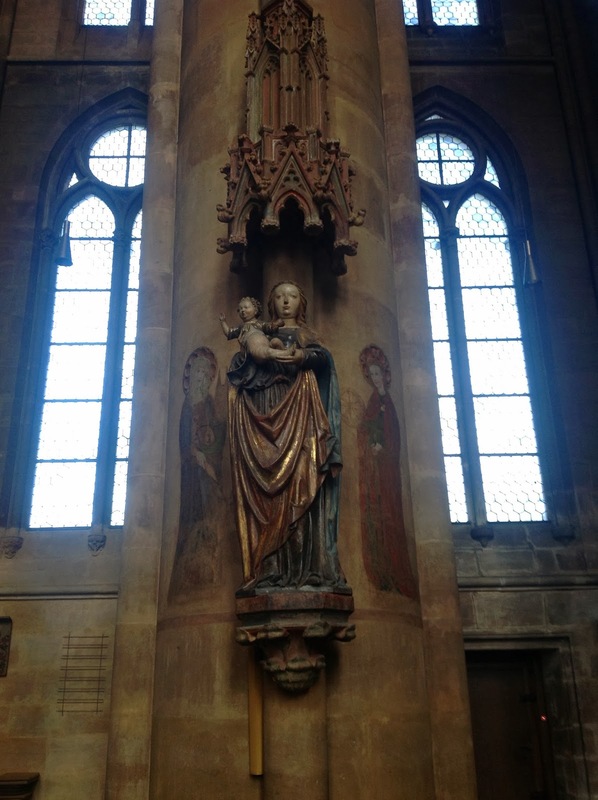 Why, the church where Saint Elizabeth of Hungary was buried. I'd love to tell her wonderful story, but this post is too long as it is. Go look it up! I was surprised, just now, to see two facts I hadn't known about: first, that her aunt was Saint Hedwig; and two, she died at 24. 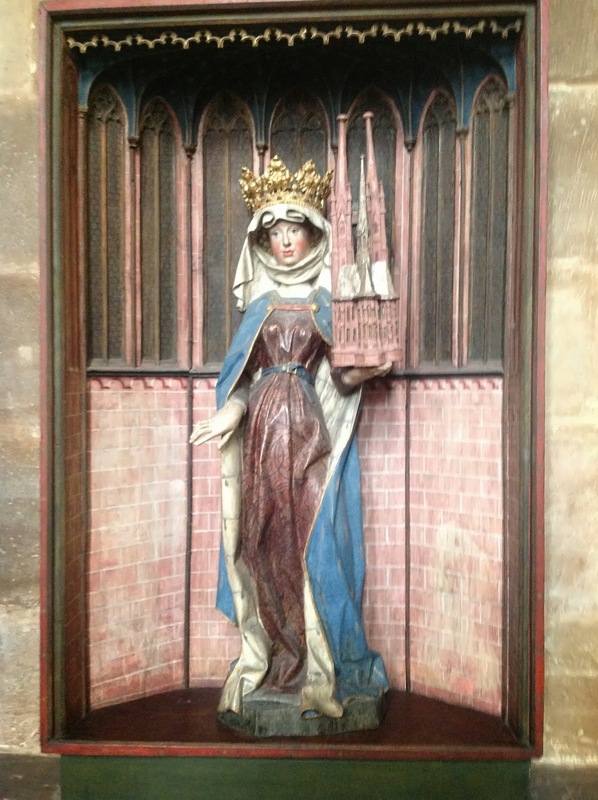 But what I had known about her was that she was devoted to caring for the poor; after her husband, the "Landgrave" of Thuringia, died, charity became her whole life; and when she died, all she had left of her possessions was a worn out blue dress, in which she was buried. As I looked around the church, I wondered what all Catholics ask: where is the Blessed Sacrament? And as I took note of more and more odd things, a terrible realization came over me: this is no longer a Catholic church!. Sure enough: there was no Blessed Sacrament; and the prayer books bore the word, Evangelische. The pamphlet I'd picked up at the door explained that when the Protestant movement began to spread, the reigning prince, Philip of Hesse, was a supporter of Luther, and so this became a Protestant church, which it remains to this day. One of the things Philip detested was the way the faithful flocked to the church to venerate the bones of Saint Elizabeth, who was buried here. So her remains were taken away; some of them are kept in Vienna. Notice anything odd? Look at the niches in the screen, what do you see? Not statues of saints. 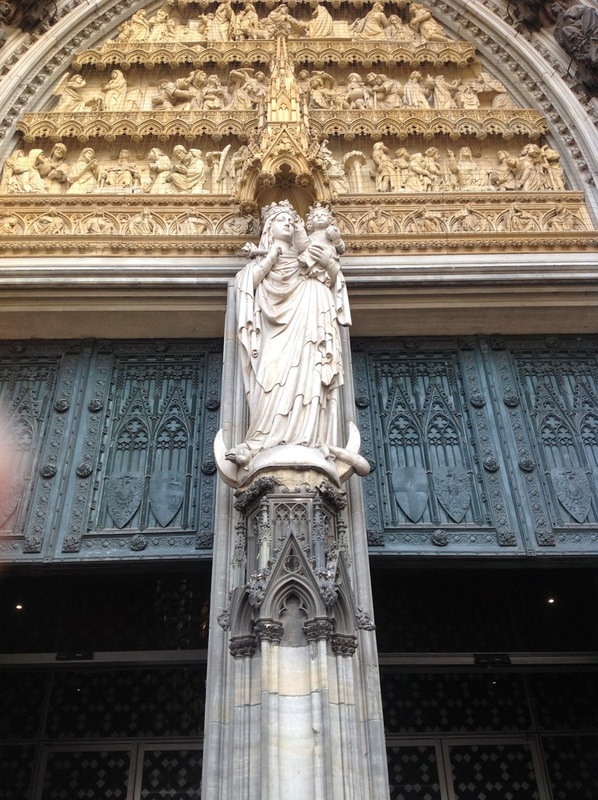 According to the literature the church provided, there were statues, but they were destroyed, all but two -- of Peter and Paul -- which were displayed on a side wall. Now look again: the niches aren't empty. Instead of the statues, what do you see? No, I don't know what they are, either; but they appear to be shapeless hunks of stone. Progress, eh? Apparently, even iconoclasts' hearts can be melted. So that was this morning. 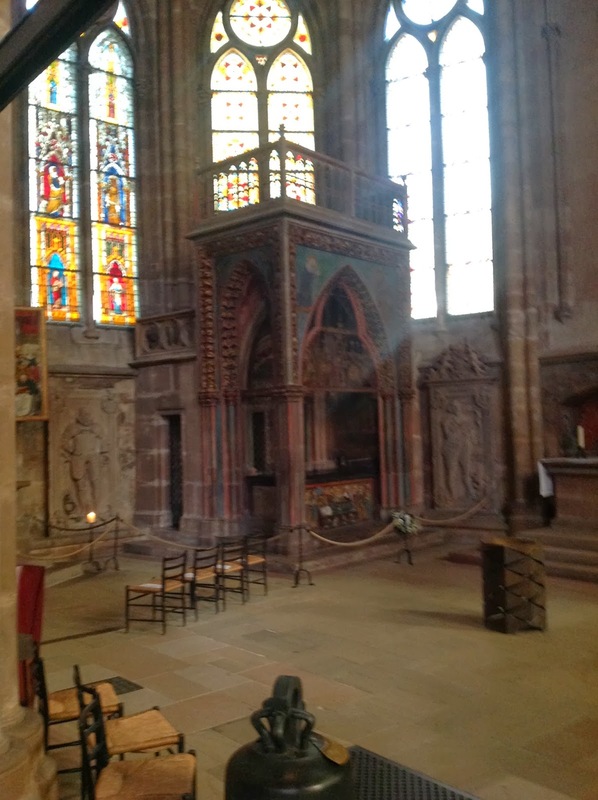 My journey took me southeast from Marburg, across farmland that could have been southern Ohio, to Fulda, where Saint Boniface, Apostle to the Germans, is buried. I took some pictures, but my iPad has died, so I can't upload those pictures at the moment! I hope I can tell you about that visit tomorrow; it was amazing. From Fulda, I continued south to Bamberg, where I am now. I'm feeling pretty good at the moment, but when I checked in, before the dinner I described at the outset, I was pretty worked up. I had exactly one nerve left, and woe betide anyone who got on it! Let me tell that story and bring this post -- at last! -- to a close. Remember what I said about streets like rabbit warrens? That's Bamberg, only moreso. Now, I managed to get to the cathedral without too many problems, and I managed to get down into the town, and after asking folks, I found the street where my hotel was. That is, I found the general vicinity; I parked, and walked two short blocks and there it was. But is this a hotel? It looked like a restaurant and a bar; in fact, there were a number of people out in front, drinking beer. Seeing my furrowed brow, a fellow out front paused from his beer, and confirmed this was the place and pointed to the right door. So I went to the counter and explained I had a reservation. Puzzled look in response. I'd seen that before on this trip -- so I showed the lady my reservation on my iPad. She smiled and pointed to the dates: I'd reserved Sunday night, not Saturday. D'oh! But she smiled and fixed it, no problem. Now, a parking space so close to the hotel is pretty good, based on my experiences so far, so I was content to leave my car where it was. But the lady at the counter advised me I couldn't do that. To my surprise, the hotel -- which is wedged in pretty tight quarters -- has "underground" parking! Get outta here! But here's my problem: I haven't got a single clue how to get my car, only two short blocks away, from there to here. Coming out of the hotel, I waved at the fellow who'd helped me on the way in; and I told him my problem. No problem! (He spoke a fair amount of English.) He proceeded to explain to me how, if I go up there -- ignore the "do not enter" signs! -- across there, down, and at the first crossing, turn right, and you'll be right here! Only he wanted to know what brought me to Bamberg. I explained, a pilgrimage, to visit the graves of Henry and Cunegunde. > Mainly, I'm in a state of shock, because I'm thinking, no, I'm just tired; this conversation cannot actually be happening, can it? > Am I still smiling? Should I be? Should I frown? I don't want to be rude. Well, somehow I broke away. And I think you can guess what happened next. The directions didn't work; or perhaps I didn't follow them closely. I have to tell you, after making the attempt several times ("round and round I go, up and down I go"), I really don't know what to say. I could swear the cathedral -- which is up on the hill above us -- moved several times just to mess with my head. So I drove up, and around, only to end up where I was -- but not where I wanted to be. Each time, I tried a larger circle. And yet...back to the same spot. So, of course, that means I have to try something different, right? What do we call doing the same thing over and over, expecting a different result? So I did--I turned down a new "street." Well, this really was an alley; and to make it even better, after a couple of turns, it proved to be a dead end alley. Now, I imagine the locals turn around in these situations; but I lack that experience. So I had one choice: backing out. Did I mention this car has a sensor, and if you get too close to something, it beeps? Guess what happened? A lot? OK -- after several joggers came through, and after a gaggle of tourists cleared out, I backed back to the, er, "main" alley. At this point, you may think I was tempted to curse and swear. But not really. In fact, my primary temptation at this point was to abandon my car. Well, I didn't. And once again, my guardian angels got me off the hill. I went down, crossed the river, went around...briefly up a narrow ramp the wrong way (at least I think I was going the wrong way--who knows? ), I got around, at last, more or less where I wanted to be. And then, a true moment of grace. An epiphany. Suddenly, a thought came to me. If you're not careful, you're gonna mess this up...again. For heaven's sake, stop and ask before it's too late. So I did. I saw a fellow, and said, "Bitte, wo ist Dominikaner Strasse?" Unfortunately, he didn't give me a short answer. And it was all in German. More with gestures than words, I asked -- "this way?" "that?" Basically, his answer had to have been, "not so simple." His wife (who had some English) came out; same result. Finally, she says -- with broken English and gestures -- that her husband will show me. He'll get in his car, I'll get in mine, and follow him. Oh hallelujah! My mistake, it turned out, was to think that was a pedestrian path between those buildings. Silly American! My new friend just plowed down it, the families out for a stroll helpfully clearing the way; and about two blocks further, there it was! That led to my car being parked (a good hour after checking in); dinner with new friends, this Dostoyevski-length post...and now it's time for bed. * Apologies for all butchering of the German language; but you have to try, and if you humbly grin a lot, it seems to go a long way with folks. For current or future reference, a subscription to Ancestry.com will zero you in on the specific areas in Germany from where your ancestors emigrated. Then you visit the town's Burgermeister and possibly locate your cousins. Your accounts of your travels are outstanding; please continue. I have an Ancestry membership, and I have two likely candidates for where the Fuches came from. But pardon me for being obtuse, but...exactly how would the Burgermeister connect me with cousins? But I'm willing to try if it really could work? Father, You have a gift for photography. Absolutely beautiful.